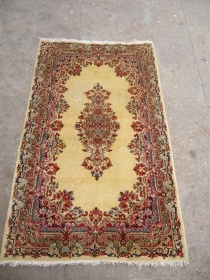 Kirman Rug with beautiful Ivory ground and very nice desigen and colors,good condition,fine weave.Size 3*5. 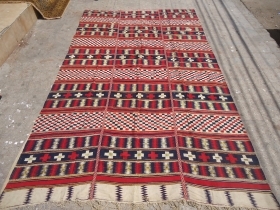 Beautiful complete flatwoven Khorjin,all original tasseles and back,very nice colors and desigen,very good condition.Size 3'9"*1'11".E.mail for more info and pics. 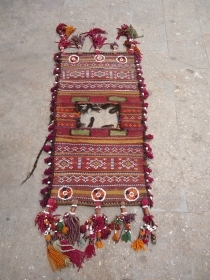 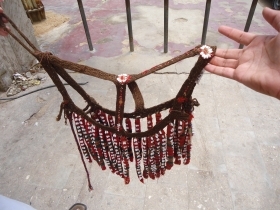 Baluch Camel Hair dress with beautiful natural colors,all original,good age,Hard to find.E.mail for more info and pics. 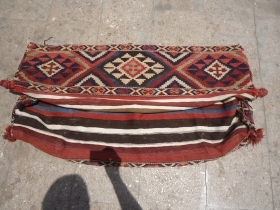 Large Camel Saddle bag,complete origianl kilim backing,all good colors,fine weave,without any repair or work done.Size 5'4"*3.E.mail for more info and pics. 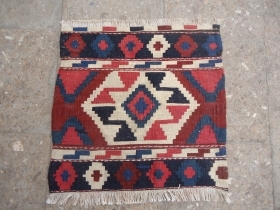 Afshar Bagface wtih nice colors and desigen,soft shiny wool,original Kilim backing.2'6"*1'8".E.mail for more info and pics. 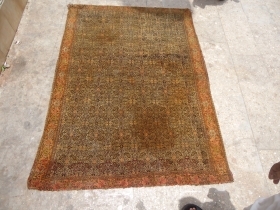 Baluch Balisht with camel wool ground,all natural colors,soft shiny wool,beautiful desigen,Kilim backing,Size 2'5"*1'5".E.mail for more info and pics. 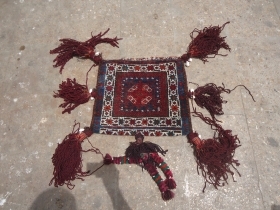 Baluch Piled Animal trapping with good weave,beautiful star stripe on Ivory ground,all original.E.mail for more info and pics. 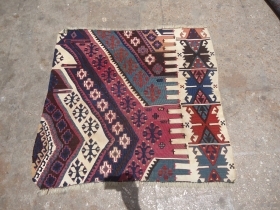 Qashqai Kilim with beautiful colors and very nice desigen,fine weave,good condition.Hand washed ready for the show.E.mail for more info and pics. 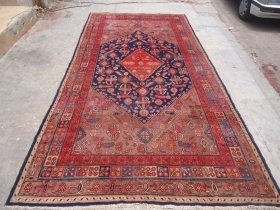 Shahsavan Mafrash panel with great colors and beautiful centre desigen,very fine weave,all natrul colors.Size 1'8"*1'8".E.mail for more info and pics. 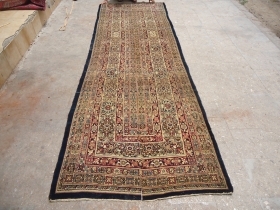 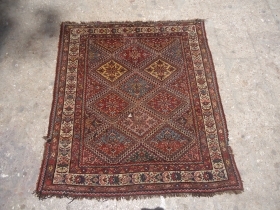 Kerman Pushti with beautiful colors and desigen,fine weave,good age,without any repairs.E.mail for more info and pics. 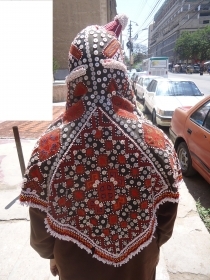 n.w. 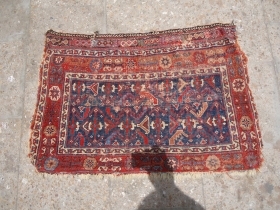 Persian Bagface ?.Very nice colors and desigen,beautiful pce.E.mail for more info and pics. 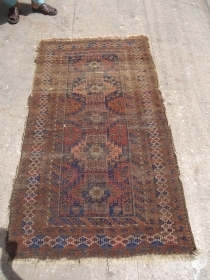 Anatolian Kilim Fragment with great colors and fine weave,good age.E.mail for more info and pics. 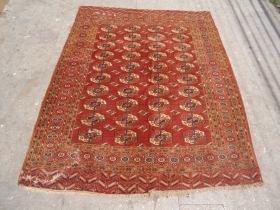 Kerman Pushti with beautiful and great colors,fine weave,very nice desigen.Ready for the display,E.mail for more info and pics. 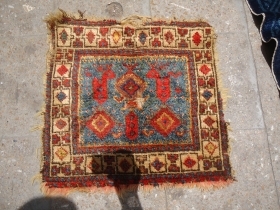 Caucasian Mafrash with beautiful colors and desigen,As found without any work done,good colors and age.E.mail for more info. 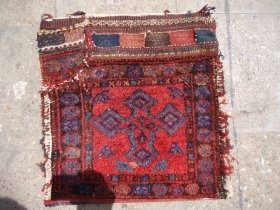 Early Anatolian Prayer Rug Fragment with beautiful colors and deisgen,good age.As found.E.mail for more info and pics. 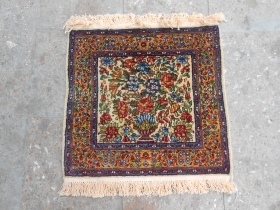 Shahsavan Mafrash side pannel with beautiful colors and desigen,fine weave,good age,all good colors.E.mail for more info and pics. 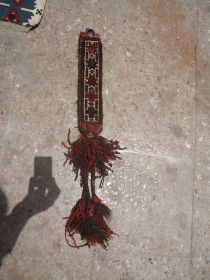 price: US$ 1500 or B.O. 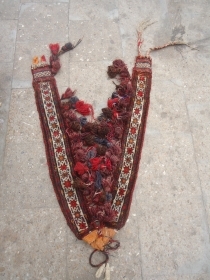 Baluch animal Piled trapping with beautiful colors and fine weave,all tassels are original,beautiful pce with good age,E.mail for more info and pics. 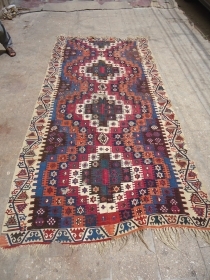 price: US$ 3500 or B.O. 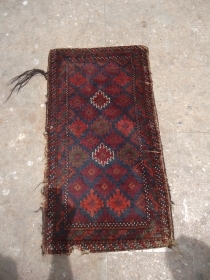 Afshar Bagface with beautiful and unusual desigen,lots of mens heads,very nice colors,Original Kilim backing,all original.E.mail for more info and pics. 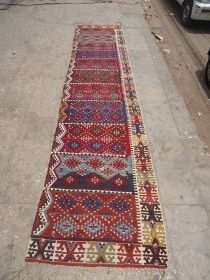 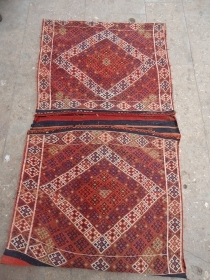 Qashqai Bagface with nice colors and bold desigen,all good colors,original kilim backing,E.mail for more info and pics. 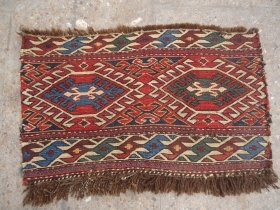 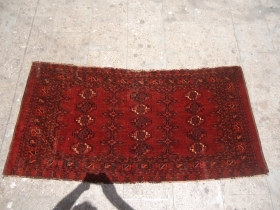 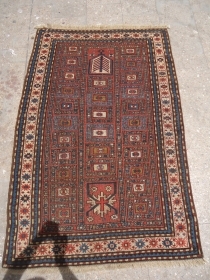 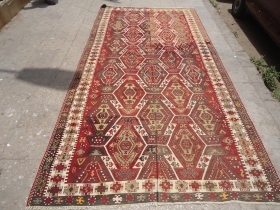 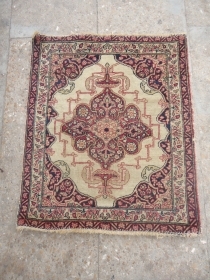 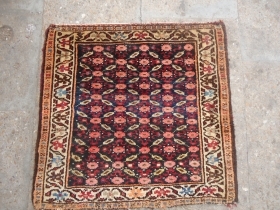 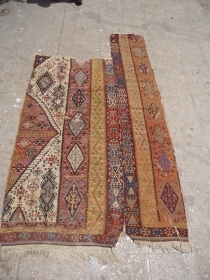 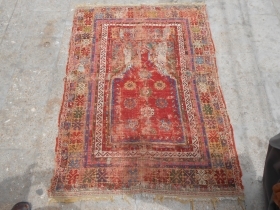 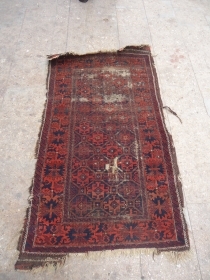 Central Asian Large chuval with nice desigen and fine weave,old repairs done,as found.E.mail for more info and pics. 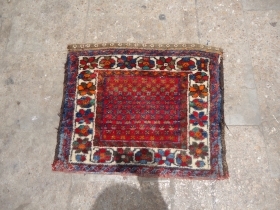 Beautiful Persian Rug Fragment,all good colors,and very nice desigen.Size 4'9"*4'3".E.mail for more info and pics. 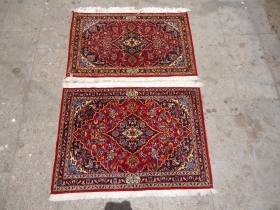 Kashan Pushti Pair,signatured as "Kashan Shadsar",fine weave good colors,good condition,nice desigen.Size 3'4"*2'2" Each.E.mail for more info and pics. 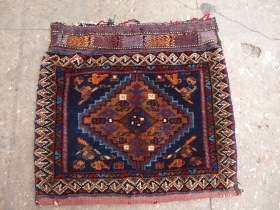 Early Afshar Bagface with besutiful colors and border,fine weave and good age,As found.Size 2'8"*1'8".E.mail for more info. 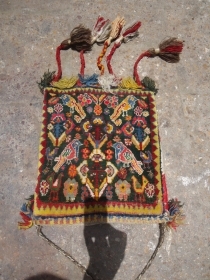 Afshar Bagface with good colors and desigen,orginal kilim backing.E.mail for more info and pics. 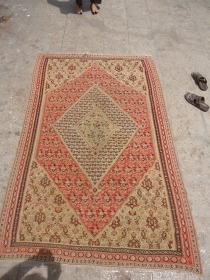 Baluch Rug with good age and colors,very nice desigen,fine weave.As found.E.mail for more info and pics. 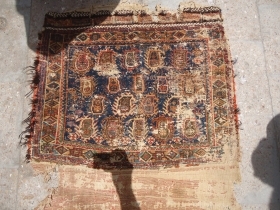 Caucasian Bagface ?.good age,colors,nice desigen.E.mail for more info. 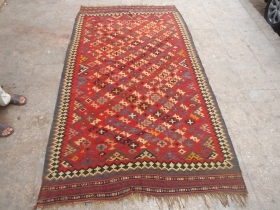 Large Swedish Flatwoven Rolakan,beautiful colors and desigen,woven into three pannels,very finely woven,good age,Size 10'10"*6'6".E.mail for more info and pics. 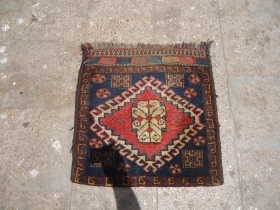 Early Afshar Bagface with good colors and age,very nice desigen,very fine weave,original Kilim Backing,As found.E.mail for more info. 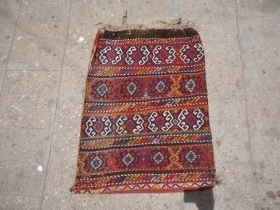 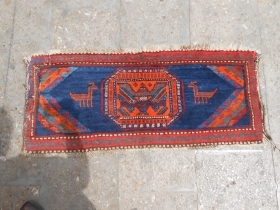 Anatolian Kilim Fragment,with nice colors,desigen and fine weave.As found.E.mail for more info. 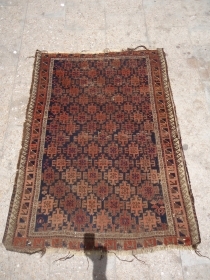 Beautiful Caucasian Bagface with good age colors and desigen.shiny wool,As found.E.mail for more info. 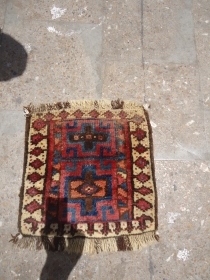 Caucasian Prayer Rug from Karabagh reigon,very unusual desigen,good age,nice colors and pattern,some old repair.Size 3'10*5'7".E.mail for more info and pics. 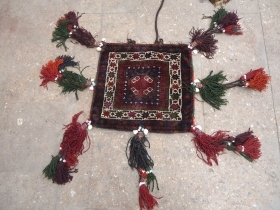 Women Wedding Dress cap ?.From Kohistan valley,Silk thread work on cotton cloth,very fine and beautiful work.E.mail for more info and pics. 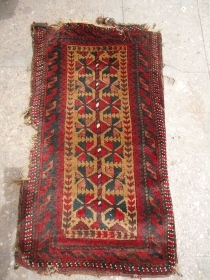 Tekke Rug with beautiful colors and desigen,good age and fine weave.As found,Size 7'9"*5'11".E.mail for more info and pics.